Bentside Spinet by Thomas Haxby. 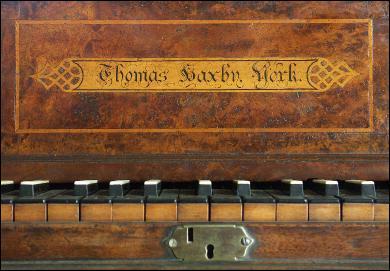 Thomas Haxby is arguably the finest provincial keyboard instrument maker of late 18th century. The walnut case with decorative brass strap hinges has sycamore stringing and a burled walnut nameboard inscribed on an inlaid plaque ‘Thomas Haxby York’. 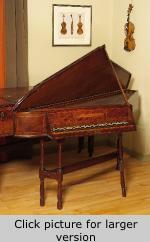 This Spinet is very similar to the 1764 Haxby in the Museum of Fine Arts, Boston. The five octave keyboard GG - f3, has ebony naturals with maple fronts, and sharps capped with ivory. This instrument has undergone only minimal restoration and remains in a highly original state.